Anthropology, Chemistry, Perception, Uses, Recipes and More! The Bible of Saffron is currently the only book on Saffron spice written by an academic and saffron expert. It reveals all the secrets of saffron chemistry and perception, and gives you exhaustive and detailed characteristics, properties and principles of use. Discover the 6 powers of saffron and learn how to implement them with 91 easy and delicious recipes. Cooking with Saffron is an insider art that you will learn to master. A must-read book for everyone willing to discover the secrets of a fascinating spice and to master its complex use. The Bible of Saffron will satisfy Amateur and Professional Gourmets as well as Chefs and Saffron Enthusiasts. The Bible of Saffron completes another book by the same author: The Saffron Farmer's Bible - specifically about the cultivation and production of saffron. This second volume in an exclusive collection by La Paradisière contributes to the rediscovery of saffron by Westerners. 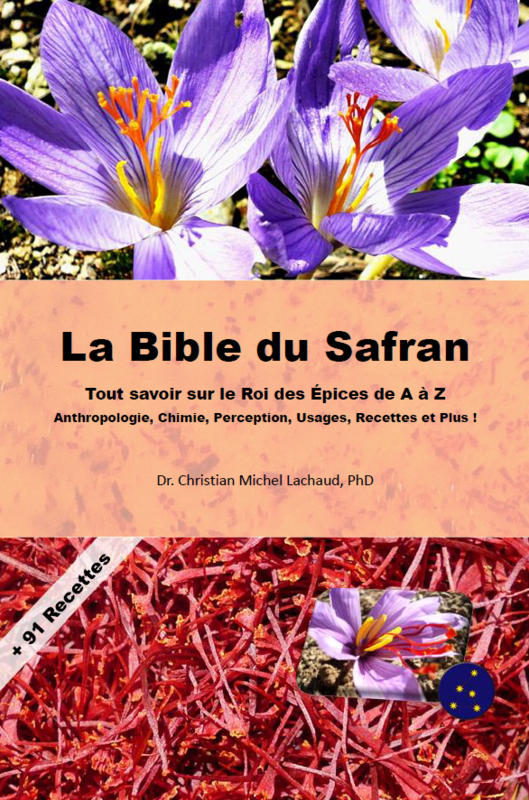 After the popular Saffron Farmer's Bible about Crocus sativus, Saffron farming and saffron spice production, Dr. Lachaud enriches our knowledge with a second volume specifically dedicated to the saffron spice. The Bible of Saffron will enlighten you about an amazing European spice, largely unknown to Westerners. 217 fascinating pages reveal all the secrets and mysteries of the King of Spices, from Anthropology to Perception and Chemistry, Uses and Versatility of Saffron, or Production and Trade. The Bible of Saffron contains many practical and detailed tips by an expert. 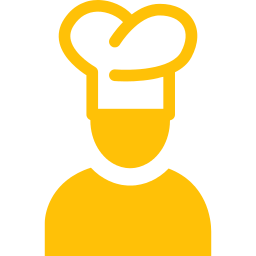 They will guide you in getting premium saffron of gastronomic and medicinal quality. Thanks to this book, you will know how to buy genuine saffron and avoid being fooled by widespread fraud. 91 Delicious Recipes for Immediate Practice! Lick your lips already! The Bible of Saffron is also a cookbook. 91 delicious and easy recipes, some of which were developed by the author, will allow you to discover the 6 culinary powers of saffron and its extreme versatility. You will learn how to master a subtle, powerful, alchemical spice, delicious and full of virtues for your health, whose successful use can't be improvised. After a very deep editorial work, this book with rich and structured content is easy to navigate thanks to included exploration tools (Table of Contents, Table of illustrations, and rich Index). The Bible of Saffron is also very pleasant to read thanks to 43 color illustrations. You will appreciate it for its informative quality, as well as for its appplied and practical side. Happy discovery, and Bon Appetit! 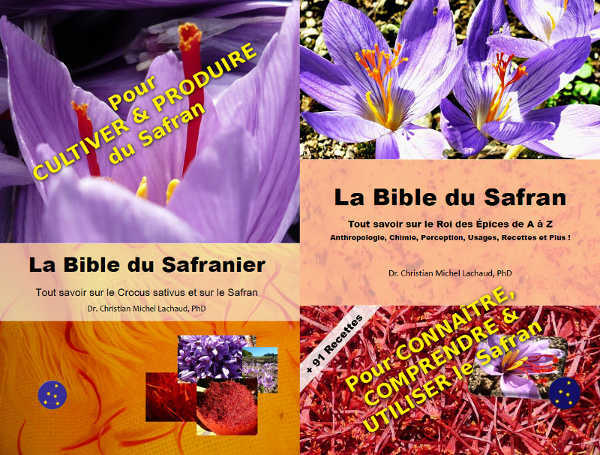 Do not hesitate to order Crocus sativus bulbs with this book to harvest your own saffron next fall! If you want to know more about saffron farming, you are most welcome to join our extensive and amazing Saffron Farming Training!